Wait… even more ancient, the days before the iPhone 4 were launched? In tech years, that’s like a lifetime ago. But in those historic days (around March 2010, less than 1.5 years ago), do you remember when Gizmodo purchased an iPhone 4 prototype? 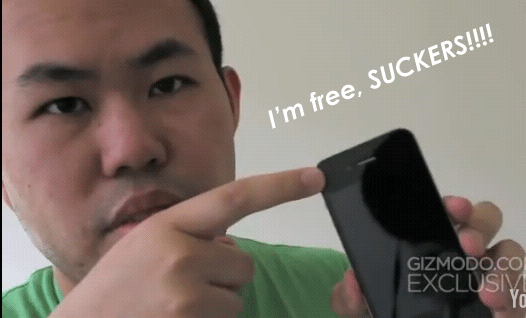 Well, finally, the California district attorney’s office has decided to not press charges against Gizmodo or Jason Chen, the former Gizmodo editor who purchased and then posted a video of the iPhone 4 prototype. The San Mateo County District Attorney’s Office has filed misdemeanor chargesagainst two individuals for the misappropriation of an iPhone 4 prototype that was lost byan Apple employee and subsequently recovered in a Redwood City establishment by thedefendants on March 25, 2010. Brian Hogan, 22, of Redwood City was charged withone count of misappropriation of lost property, and Sage Wallower, 28, of Emeryville, wascharged with misappropriation of lost property, and possession of stolen property. Their arraignment is scheduled for Thursday, August 25, 2011 at 9:00 in Redwood City. After a consideration of all of the evidence, it was determined that no charges would be filedagainst employees of Gizmodo. For questions about this case, please contact Assistant District Attorney Morley Pittat (650) 363-4785.1.